Do you work at Dalston Jazz Bar? 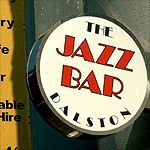 What did you think of Dalston Jazz Bar? this place is TERRIBLE! Please do not even think about going here for dinner it's the worst food I've ever eaten. We were also the only table in there and after eating I know why. Drinks were standard but music was awful too, thoroughly ripped off! To find a place like this in London was a surprise, I had a great time. The live band was the highlight, if you like Jazz music and reasonably priced drinks then this is the place for you. Everyone was out to have a good time! The bathroom is a little small, but I will let that slide due to the great music. Situated in the heart of Dalston, was very easy to get there and get home. I have returned a few times and never been disappointed. Also the food is great, compliments to the chief! Wish it was open to even later! I purchased this deal a few weeks back. Every time I tried to make a booking with Robert he said that he was fully booked. After two weeks of trying I received an email response from him. When I tried to confirm this booking I didn't hear from him for 4 days. I tried calling the restaurant and when I finally got through he stated very rudely ,"If you emailed me then I will respond to you through email" and then hung up the phone. On the fifth day of finally getting through to him the booking was made. The menu was looked at online so so knew what food they had. Upon arriving at the restaurant the waitress said that the menu had changed. Not only was the entire menu different to what was online but they only had to main course. One which was pork which for religious reason I do not eat and they ran out of chicken so made a substitute which was RABBIT. I do not eat rabbit either. I asked if there were any other substitutions or food items that I could purchase if they were not on the voucher and I was told no. I even asked if I could have two of the starters since I couldn't eat any mains and again I was told no and that they had run out of a lot of food. Robert then told the waiter that I should of arrived at the restaurant earlier and I would of got food that I wanted and that I booked for 7:30. This is completely incorrect. After him sending various people to tell us no he finally came over when my partner got very upset and stated that the voucher does not guarantee us food but an invitation to eat. He claimed he was a lawyer as well. Then he said Incan return to living social and get a refund. So I drove all the way from South East London to be told I could leave . This could be the most and Unexpected jazz bar in London ; the Dalston jazz bar is part restaurant and part club. The live jazz is great , the vibe is something else, very bohemian, and nobody is pushing you to keep drinking if you just want to hang out all night. Friday and Saturday should not be missed, Boy this place has changed.! This is definitely my favorite place. My favorite place for live music that I found. It's a pretty small place and gets packed easily,so go early for sure.its a really cute atmosphere. The waitress are really attentive and on top of getting you drinks . Without the owner the place will not be the same. He is artist ;the decoration is out of this world . Being a artist myself I am inspired when I am in the Dalston Jazz bar. Rustic and raw . The food is homely and spiritual . Thank you Dalston jazz bar. Everyone knows dalston has changed; but what bar created the new trend in dalston? The Dalston Jazz Bar. I know it was free! But they are charging now like all the new pretentious bar. ( jhonney come lately). The Jazz Bar caters for the older crowd who wants to communicate and meet other people. The Jazz bar has customers from all around the world and caters for all sexuality. Now everyone is copying the jazz bar even the decoration. Some people just do not. Get it. The jazz bar is just a fun place ,people go there just to have fun. These new wave off people from outside should go back to shoreditch. The new rustic restaurant is a nice touch real food and homely I loved it. Please no more changes. Love the music and its the best place in dalston to meet a real person. Love love. Dalston jazz bar. This is what jazz is all about . You can go to a night club anywhere but you're not gonna find a place like this anywhere. I was quite taken back when I went to Dalston jazz bar on friday. The bar has completely changed ; there were a live jazz band on and they have incoporated a kitchen in the bar area.The restaurant was packed, we managed to get a seat at the bar. The venue is quite cosy and intimate and there's a great buzz in the air. The house band played with a quest which was really great. We decided to have something to eat and was quite taken back to find wild squirrels on the menu. We opted for the wild rabbit in honey and cider sauce; my husband had the fillet of seabass in pepper sauce. The food was wonderful. We will be going back; we loved the changes and the restaurant is definately the right way to go. The current hype may surround the after hours parties that Dalston keeps throwing up, but the long-standing Jazz Bar is still the place that just won’t quit. At home amongst the Chicken Cottages of the high street, Dalston Jazz Bar blends in with its filthy exterior and occasional cracked window. A little way north of Dalston Junction, and where once there was an empty old car park, the club now sits sweetly next to bicycle parks and pedestrianised asphalt, rocking somewhat of a shack vibe. But exterior isn’t everything as they say, and so within, where the temperature rises rapidly, there’s a vaguely library-esque look that momentarily intrigues. Space is a premium; one step inside and everyone’s up in your face. Corrugated iron shelving holds a scant amount of books at the edge of the room and there are a minimal number of old sofas sat around the place. Fridays and Saturdays are fun at Dalston Jazz Bar, especially if dancing up against strangers to awesome music floats your boat. It’s always hot and sweaty, the bar is a nightmare to get to and you’ll be wetting your pants before you get to the toilets (there are just two unisex) but good times are still in effect. However, sweetness isn’t everywhere and, on rare occasions, the strange mix of oddities, hipsters and locals can grate, but this tends to last only until the next song. DJs are on rotation behind CD decks where the musical possibilities are endless. Always expect to hear things like Dawn Penn, Sister Nancy and Arrested Development because, somehow, they know the ones you never get bored of. The closest things you get to jazz at weekends is Jazzy B and there’s a preference for heavy danceable tracks to keep the crowd moving. Soul, hip-hop, funk and disco blend seamlessly in the mix. The simple counter bar is laden with pools of crushed ice and fridges, but somehow they manage to keep the liquids looking desirable. Mojitos are popular, served in plastic pint glasses at rapid response times, they’re a bargain at £5. Apart from the cocktails there’s a whole fridge of beer cans and bottles that you’ll pay way over the odds for, including Leffe Blonde and Brun. You’re best off sticking to the cocktails. Whether you’re just starting off your night, or looking to end somewhere hip and grimy, the Dalston Jazz Bar offers good times and a quality playlist.